In the 1960s, Bernar Venet embarked on an unprecedented radicalisation of the artistic experience and aesthetic production. Deterred by the hackneyed conventions of French art and fascinated by American formalism and, above all, Marcel Duchamp, from 1970 onwards, he emerged as one of the leading figures of conceptual art. For the very first time, the exhibition aims to explore this little-known period of his career, which began in Nice and unfolded in the United States. Conceptual, sculptural and pictorial, at this point Bernar Venet’s work was moving towards a reflection on the identity of art and the relationship between artistic expression and scientific knowledge, combining uncertainty, unpredictability and disorder with mathematical data and information theory. This extremely productive period, during which he incorporated the pure abstraction of scientific research and the objectivity and rationality of mathematics into the field of art, also marked the start of a truly multidisciplinary approach. 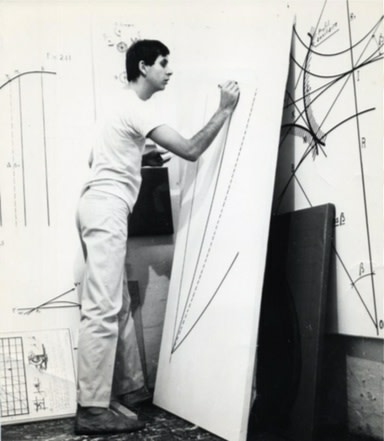 Stimulated notably by his friendship with the Judson Dance Theater’s artists, Bernar Venet actually tackled a project for a ballet, organising performances and conferences, which will all offer pretexts for arranging a program of events associated with various local stakeholders. Alongside the presentation of around a hundred works, numerous archives from the Venet Foundation will shed light on the artist’s creative process. The exhibition is envisioned as a diptych: while the Museum of Contemporary Art in Lyon (MAC) is organising a full retrospective of his work, the Museum of Modern and Contemporary Art (MAMAC) is offering visitors the opportunity to immerse themselves in this specific and intense period of his work, which enabled Bernar Venet to be recognised as one of the great artists on the international conceptual scene in the 1960s.